For a man with only limited use of his right arm, a successful career in boxing seemed an unlikely path for Joe Hughes to follow. But despite being born with Erb's palsy, a condition which affects the main nerves in the upper arm, the 25-year-old has racked up a record of 14 wins and only one loss in 15 professional fights to date. His success has earned him a fight for unbeaten Jack Catterall's WBO intercontinental super-lightweight title on Friday. "When I was born, my shoulder was stuck on my mum's hip, and the midwife just pulled me out by my head as hard as she could," the reigning English champion told BBC Wiltshire. "As she did, my shoulder was dislocated and there was a lot of nerve and muscle damage to my right shoulder and due to that it hasn't grown properly. "It's about three inches shorter than my left arm and it's quite a bit weaker. The muscles in it become very very tight, but I just try not to let it hold me back and keep working hard with it." Hughes turned professional in 2010 after 70 fights in the amateur ranks, but his reasons for first getting in the ring as a child had little to do with dreams of forging a career in the sport. "I did taekwondo when I was about five years old, and my dad took me along because it was sort of an exercise for the shoulder," Hughes said. "Since I was born I had to do physiotherapy on it and obviously when you're a child you don't want to do those standard exercises, it's boring for a child. "Then at about eight years old my dad took me along to the local boxing gym, Malmesbury Amateur Boxing Club, for the same reason, tricking me really into exercising it. "I had my whole amateur career at Malmesbury and haven't looked back since. And it's my job now, so quite a funny profession for someone with my condition." 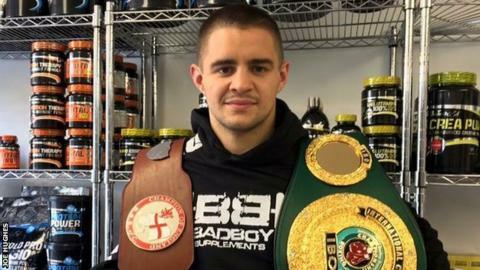 While taking Catterall's belt is his current goal, the Bristol-based boxer admitted he is also motivated by the desire to silence people who doubt his ability to compete. "When I was born they told me I'd never be able to run in a straight line - I don't know why they said that, but that's what my parents were told - I'd never be able to have a manual job, I'd have to sit at a desk all my life, never be able to play contact sports," he said. "When I first started boxing I just wanted to have a bout so just doing that was an achievement and that was proving people wrong. "Most people would think you've got Erb's palsy, there's no way you can possibly be successful in a sport such as boxing and I just want to prove that yes, you can. "As long as you're willing to put the work in, you can definitely achieve it." Hughes goes into Friday's fight knowing that few are backing him to beat Lancashire's Catterall, who is ranked number four in the world by the WBO and will have a partisan Manchester crowd behind him. "I've always been the underdog really, with my shoulder and everything, I'm going to every fight with a disadvantage and as an underdog, and I relish it," he said. "I'm fighting in his backyard, and because it's so far I don't have a massive following that can travel up there - one of my friends can't come cause he can't get anyone to cover milking the cows at the farm. "Jack's number one in Britain and all that, but if I beat him I become number one. That's what I'm aiming for. "I know it's a very big challenge and he's a very good kid, but I believe that I can beat him."